When your young child has an allergic reaction to something, Benadryl can be helpful in calming down the symptoms. Diphenhydramine is the generic name for Benadryl and is available over-the-counter. It is an antihistamine that helps reduce the body’s reaction to allergens. If you need to use Benadryl, always consult your pediatrician for advice first. Benadryl is dosed solely using the child’s weight and has nothing to do with how old they are. For your reference, you can use the chart below to see the proper dosage for your child’s weight. 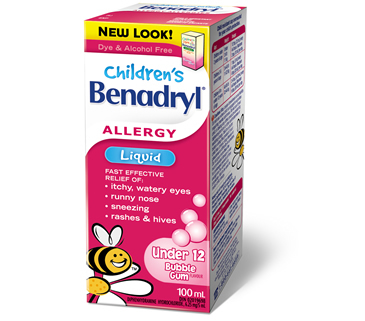 You can find Benadryl at any drug store in chewable, tablets and liquid formulations. If your child is less than 18 months old, it is advised to give them liquid to help prevent choking. Is It Safe To Use Benadryl for Babies? As with any medication, it is very crucial to check with your physician before using Benadryl for babies. Benadryl has a side-effect of sleepiness and should only be given under the advice of a pediatrician. If a very young baby (under one year) appears to have an allergic reaction or rash to something, check with your doctor or take the baby to an emergency room for evaluation. It is important to NEVER use Benadryl or any other sedating medication to babies less than 1 year old just to make them sleep. Make sure that babysitters and daycare providers do not give your child Benadryl. This has been found to have happened and may put baby into too deep a sleep and cause harm. Understand that the one major side-effect of Benadryl is sleepiness and dosages must be given strictly according to dosage guidelines for allergic reactions only! Overdosing could slow respirations and/or heart rate in a small child. Benadryl is only given as needed every 6 hours and should not be given more than 4 times in a 24 hour period. Babies less than 1 year old should only be given Benadryl under a doctor’s supervision. Check the medication label carefully for the concentration amount and use the measuring device that was provided with the product in order to correctly dose the medication. Never use a teaspoon used for food purposes or medication devices used for other medications i.e. Tylenol or antibiotics. If you have given a dose of Benadryl, watch for side-effects such as; excessive sleepiness, slowed breathing and lowered responses. If these happen, consult a physician as soon as possible. Watch for trouble breathing, severe hives, drooling, flushed skin color, coughing or wheezing. If any of these symptoms happen, go to your local emergency room or call 911 if necessary. What Is the Proper Dosage of Benadryl for Babies? Cold use: No proven effects on cold symptoms. Do not use under 4 years of age for cold symptoms. Dosage: Use above table to find child’s weight. The proper dose is below the child’s weight according to which type of product and strength. Be sure to check strength carefully. Use the syringe or cup that came with the product ONLY! If you do not have a syringe or cup, use a clearly marked syringe or cup from the pharmacy. Do not use kitchen teaspoons used for eating. Equivalents: ½ Teaspoon = 2.5 ml, 1 Teaspoon = 5 ml, 1 ½ Teaspoons = 7.5 ml and 2 Teaspoons = 10 ml. Young children and babies have a hard time tolerating long trips. They may scream and cry or wiggle and want to run around. Some parents need to make a choice as to how to deal with this issue. There are many conflicting opinions on whether it is ethical to sedate a baby using Benadryl for long periods of travel via car, airplane or public transportation. The ethical issue is definitely up to the parents. The main question is whether or not it is safe to use Benadryl to sedate a young child. Is It Safe to Use Benadryl to Sedate Your Baby? For some parents, they may be tempted to want to use a sedative medication such as Benadryl to make their child sleepy. This is due to the fact that the main side-effect of Benadryl is sleepiness. While Benadryl does have a pretty safe history, some children may actually have the opposite effect and instead become hyper or overstimulated on the medication. On the flip side, this medication may cause excessive drowsiness, lower respiratory rate, irregular heart rate, seizures or blood pressure issues. If a child is having an actual allergic reaction to something, that is more serious than the side-effects. Using this medication as a sedative for a child is not worth risking these serious side-effects and therefore, NOT recommended for use as a sedative. If traveling by car, do a shorter trip of an hour or two to allow your child to become accustomed to longer car rides. Bring along healthy snacks your child likes. Bring some toys, books and car games to keep your child entertained. Take rest breaks from driving every two hours and allow your child to get out of his or her car seat. Always ask your pediatrician first. This may not be safe for your child due to side-effects or if your child has an underlying health condition. Make sure your doctor tells you the right dose to give your child. This needs to be based on your child’s correct weight and they may need to weigh your child. Once your doctor has given the “go-ahead”, try giving your child a test dose to see how they react to the medication at home before your traveling.